I like to think of Monte Grappa as like a sleeping giant from another time. This majestic Monte sits at 1775m and lies to the west of Venice between the Venetian plain and the Central Alps, and on a clear day you can see the fabled water city. There are four main routes to the top and a number of smaller roads feed into these four on the way to the top. We have not only ridden up on a few occasions but, we have also driven up when we were doing some recon in the area, and it is an ascent that I never tire of. The terrain changes from the wooded forests on the lower slopes to tunnels that cut through rough rock, with the road narrowing to a tiny lane that clings to the edge of the Monte that looks as though only one car can pass…but as we found out, it turns out you can have 2 cars pass in an albeit hair-raising experience. Not recommended. This tiny road then gives way to the hairpins in the distance, before dissecting a plain that is 3/4 to the top, before another pinch to the monument at the top in honour of the fallen soldiers of WW2. This is not an easy endeavour, but one that has many rewards as you overcome the 25k challenge. The weather can be very changeable depending where you are on the slope. It can be everything from shrouded in mist in the forest and lower slopes to bright sunshine along the plain and at the top. Every time we do this climb, there is something that is special and strikes a cord. It could be the hooting owls as you navigate your way through the quiet forest. It could be Michael articulating his surprise at seeing the hairpins as he rounds the corner or a visual that will forever be etched in your memory. And then there is the descent, which is without a doubt worth the effort and time it takes to get to the top. The descent starts out open and fast as you drop away from the monument, turning a bend you can see the tiny road weave it’s way into the forrest, like a loose thread carelessly thrown on to the land. Once entering the forest you have a bunch of close hairpin bends before the incline lengthens and you are once again on the valley floor. And how can you not love a mountain that has its own amaro or digestivo – an Italian after dinner drink that helps aid digestion! Salute amaro Monte Grappa. 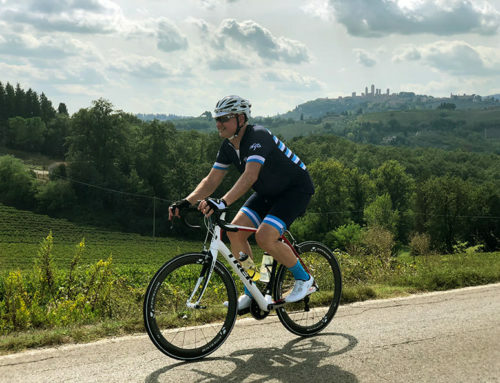 If you’d like to tackle Monte Grappa with us, you can join the team on our Dolomites & Prosecco Road tour Dolomites & Prosecco Road tour and what we are affectionately calling our last day – the Monte Grappa Gran Fondo – it’s going to be a grand finale to an amazing week of riding.